If you enjoy super yummy desi meals, then have your next meal at Sheetal Daa Dhaba in Lonavala. So head out of town this weekend and make a road-trip out of it. An open-air garden restaurant, Sheetal Daa Dhaba at Karla in Lonavala has been serving delicious multi-cuisine grub for almost 16 years. Cane chairs, wooden décor, quirky lamps and lights make for a lovely vibe. However, the highlights of this dhaba are their super quirky washrooms that are Batman and Harley Quinn themed.We tried their mutton shorba soup which is an absolute must-try. Well known for their ‘Tandoor ki aag se – kebabs’ we tried their special paneer banjara kebab and mutton malai chop which were total winners. We also recommend you try their cheese chilly garlic naan (owner’s special), butter chicken and end on a sweet note with the all-time-favourite, gulab jamun.Sheetal Daa Dhaba also serves alcohol, but the show-stealer is the sheesha with ‘Sheetal special’ and ‘Dubai special’ being their bestsellers. Sheetal Daa Dhaba hosts live singers as well. Monsoons are all about long drives and warm meals. 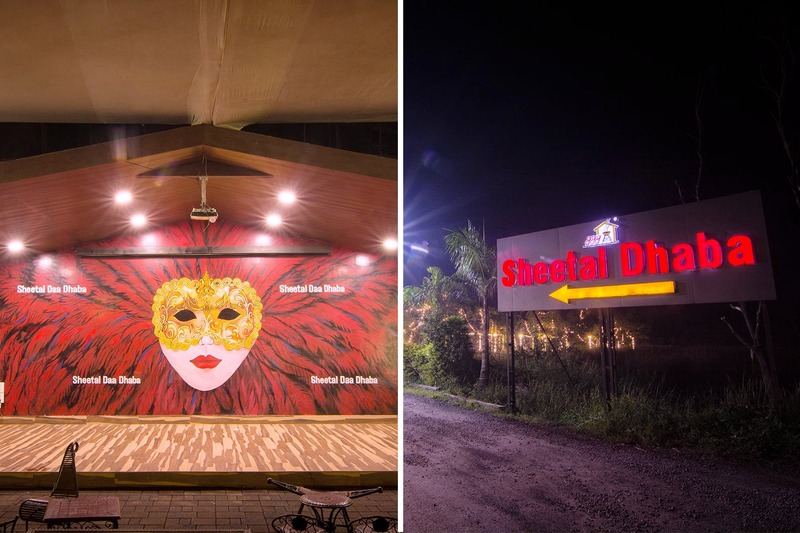 So we’re saying, do not forget to drop by at Sheetal Daa Dhaba on your next trip to Lonavala.